In the summer of 1855, when the nineteen-year-old Sam Clements traveled from Saint Louis to Hannibal, Paris, and Florida, Missouri, and then to Keokuk, Iowa, he carried with him a notebook in which he entered French lessons, phrenological information, miscellaneous observations, and reminders about errands to be performed. This first notebook thus took the random form which would characterize most of those to follow. About the text: In order to avoid editorial misrepresentation and to preserve the texture of autograph documents, the entries are presented in their original, often unfinished, form with most of Clemens' irregularities, inconsistencies, errors, and cancellations unchanged. 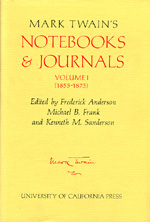 Clemens' cancellations are included in the text enclosed in angle brackets, thus <word>; editorially-supplied conjectural readings are in square brackets, thus [word]; hyphens within square brackets stand for unreadable letters, thus [--]; and editorial remarks are italicized and enclosed in square brackets, thus [blank page}- A slash separates alternative readings which Clemens left unresolved, thus word/word. The separation of entries is indicated on the printed page by extra space between lines; when the end of a manuscript entry coincides with the end of a page of the printed text, the symbol [#] follows the entry. A full discussion of textual procedures accompanies the tables of emendation and details of inscription in the Textual Apparatus at the end of each volume; specific textual problems are explained in headnotes or footnotes when unusual situations warrant.